Just before Christmas the 3rd annual ‘Digital Culture’ report was released, this is a longitudinal study looking at the adoption and impact of “digital technologies” in the arts sector. There seem to be a number of idiosyncrasies with the survey, namely that it tries to force everything into little Arts Council shaped boxes that have come straight off a funding application, also that the number of participants that have participated in all 3 years (240ish) is far fewer than those who have just participated in 1 or 2 of the years (350) – which renders longitudinal comparisons slightly tricky. But leaving all that aside, I read the report and have vomited up some thoughts on it all below. Something perhaps worth noting, I have only read the report, I haven’t taken a look at the raw data, thus my observations are made on the assumption that the analysis in the report is correct. Digital is apparently becoming less “important” for arts organisations, everyone seems to see it as a marketing thing and not much more than that. Those that are making the most of digital are those with more money, particularly NPOs who seem to be leaving the rest of the sector behind somewhat. The above, not-really-all-that-surprising, quote is the main thing that jumped out at me (and seems to be the main thing that others have picked up on). Unfortunately this seems to be becoming applicable to more and more aspects of arts organisations’ activity, this probably points to deep-rooted funding inadequacies and entrenched sectoral issues but I’m not really qualified to answer either of those particular problems. If you look at the “factsheets” for each artform covered in the survey it would appear that “business models” and “distribution are the two things that the organisations perceive “digital” least important for. Pretty much everyone says that it is “most important” for “marketing” and most artforms also seem to stick “archiving” in the “most important” box (I’d argue there could or should be a fairly tight link between distribution and archiving but hey ho, these are the labels they’ve gone with). 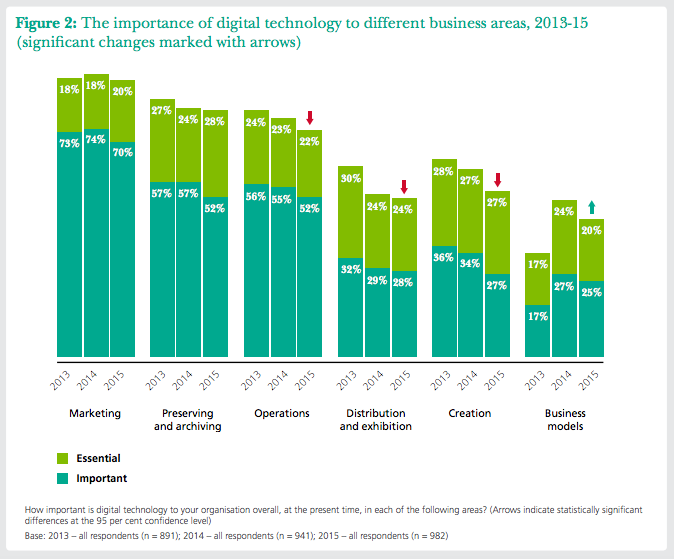 Interestingly, or misleadingly, the executive summary presents this as “Digital technologies have also become more important for revenue generation, with 45 per cent of organisations now reporting that this is important to their business models, up from 34 per cent in 2013” i.e. most organisations in the study do not see digital as important to their business models (which Chris Unitt explores, under the wider scope of “digital leadership” a bit here). The depressing thing is that the Digital R&D Fund for the Arts (which conducted this report) clearly sees these things, particularly business models and revenue generation as the more important areas for the sector to try and focus on (judging by both the “guides” on the homepage of their website and the premise of the Fund i.e. “supports ideas that use digital technology to build new business models and enhance audience reach for organisations with arts projects“) so this points to either a failure on the part of the Fund or the sector in this area. Either the Fund failed to push money towards the right projects to achieve its aim of proving new business models that are adoptable and adaptable across the sector or the sector has proven itself incapable of understanding and utilising the findings that these funded projects have thrown up (I suspect it’s a little of both). “significantly fewer organisations (especially smaller ones) report that they exhibit the R&D behaviours that the survey suggests correlated with digital success, such as experimenting and taking risks, and evaluating the impact of digital work” which chimes with the other finding that “Take-up of data-led activities has also stalled or fallen back, for example 43 per cent now use data to develop their online strategy, down from 47 per cent in 2013” given that data-led activities and effective evaluation share similar skillsets this possibly highlights a bit of a skills gap. Perhaps related to the above was the finding that “respondents report a number of organisation-related factors which might inhibit use of digital technologies. More report there being no senior digital manager in their organisation, IT systems being slow/ limited and there being a lack of suitable external suppliers“. I think the first part of this is most important, if there is no senior, or at least dedicated, digital person in an organisation then digital is never going to get the attention or understanding that it requires (this also relates back to Chris Unitt’s post that I linked to early on digital leadership) and if an organisation has very limited funds then they’re not going to free up space on the payroll to employ a dedicated digital person – this issue is even further exacerbated when digital is seen as not important to business models and/or revenue. It’s hard to make a case for something that you don’t believe will have any impact on the bottom line when funds are tight. The point around there being a “lack of suitable external suppliers” is, frankly, untrue. Although if people are reporting this then clearly work needs to be done around making organisations more aware of the numerous, talented suppliers out there (although, again, if you have no dedicated digital resource looking at this then of course your understanding of the options available is likely to be limited or non-existent), everyone’s favourite Chris (Unitt) has, once again, done something useful to this end; a big database of suppliers, split by services offered – which can be found here. Further on that “digital person” point, rarely if ever do I see digital people employed in anything other than an administrative capacity (which this report would back up). I understand that these skillsets (i.e. being able to input on the administrative or creative sides of a company’s activity) are (or can be) quite discrete from one another, maybe that’s because I’ve lived a sheltered life or maybe it’s because, as still seems to be the case, the arts sector very much sees digital as a “marketing thing” that shouldn’t be allowed anywhere near creative practice. Which is a shame and, I think, fundamentally shortsighted. Especially when you get to the point of “distribution”, if you as an organisation have no history or understanding of how to integrate digital into the artistic side of your work then how will you ever be able to meaningfully adopt any form of digital distribution for that work. Anyway, that’s possibly a thought for another day. “41 per cent now accept online donations (up from 35 per cent in 2013)” – what on earth are the other 59% doing!? Most of them are registered charities! All the charities I am aware of accept donations online, through JustGiving or whatever. “outside London around 41-44% (depending on area) of organisations sell tickets online, compared with 54% of London organisations” perhaps this is such a strangely low statistic because they’ve lumped in organisations who simply don’t sell tickets for anything (museums and whatnot) but, taken on face value, this seems very surprising and worrying. “We moved to a new booking system which works very well except in terms of online booking. This relates to a lack of resources to integrate into our website, which is not fit for purpose. We need to build the ‘front window’ for the technologies we invest time and money in by developing a new website. The Garage [performing arts venue in Norwich]” – I’ve seen this in numerous sectors I’ve worked in, organisations end up lumbered with (more-often-than-not) legacy systems which were never conceived for the modern, interconnected technological landscape that we now have to deal with. Luckily there are a growing number of forward-looking suppliers in this specific area (i.e. ticketing) so that pretty much any size organisation should be able to find something that suits their needs/budget. The AHRC has an article, entitled “Adoption of digital slows among arts and cultural organisations” which is a far more succinct summary than I’ve provided here. I’d agree with all those points to a certain degree (although I think distribution can/should be important, just the best option hasn’t been cracked yet) and have written about them specifically in the past. I’m not sure this all tells us much that we don’t already know although I was pretty shocked by the lack of basic activity being undertaken by a significant minority of organisations. Maybe the Arts Council/whoever should be looking to raise the capabilities of the bottom end of the sector before it tries to do anything too fancy, the fact that you still can’t give so many organisations your money via the internet is pretty ridiculous. Narrowing this gap would surely then help to create a more solid foundation from which ‘innovative’ things could be explored. It also seems clear to me that funders should be looking to seed-fund projects which could benefit the whole sector and provide micro-grants to encourage experimentation, whether or not either of these things will actually happen is open for discussion though.